Simply Indian first opened its doors over 17 years as a small 30 cover Bring Your Own wine & beer restaurant. An intimate casual dining restaurant our menu offers a range of authentic South Indian food bursting with flavour. Located close to Borough tube station we are the only Indian restaurant Borough based often referred to as the hidden gem in London Southwark. We have won the TripAdvisor Certificate of Excellence Award since 2013/14/15 and are proud to announce we have also been awarded current year 2016! 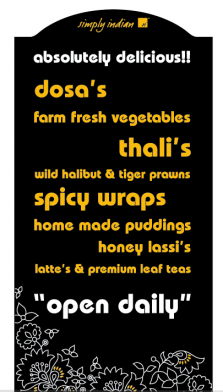 The mainstay of the menu are the dishes which best represent North and much of South India and consists of tasty dosa through to rich and creamy meat curries, we are also fully certified halal through out all our meats. We offer a good selection of vegetarian dishes and fresh seafood dishes. We buy only the freshest ingredients, our meats and fish are fresh and source locally where we can to ensure our dishes are full of flavour. Our menu offers something for everyone and that is why our customers return back to us time and time again. As a BYOB we don't even charge corkage fees based in se1 as we want or diners to feel at home while dining with us. If you are not sure what to order then our team will recommend dishes to you based on your palate and what you like. It is not often our diners are disappointed with the recommendations. We may be a small restaurant but our food is that of gourmet restaurants.